Air Cortez International (AB), was a regional commuter started by William Schlick in 1976, to be based in Ontario, California. The new airline received its operating certificate April 5, 1977. The small airline focused its work on services and charters to the small seaside towns in Baja California, Mexico. Flights from Ontario to Guymas, Mulege and Loreto, Mexico were flown using a mixed fleet of Cessna 402, 414, Beechcraft 18 and a single Douglas DC-3 aircraft. Yuma, Arizona became a stop on certain weekly flights from Baja Mexico. Charter work continued to be offered to a variety of locations in the western United States. In April 1982, Air Cortez started scheduled passenger services between Las Vegas and Grand Canyon Airport using the Beech 18 aircraft and providing a convenient link to the popular tourist destination. Looking to expand services, the airline ordered two Fairchild F-27A aircraft to increase passenger capacity and expand its route structure. The first F-27 arrived in July of 1982 and was initially used on the Las Vegas-Grand Canyon route. Additional Fairchild F-27s were acquired and Air Cortez added San Diego to the network on an Ontario-San Diego-Guymas-Mulege-Loreto route. 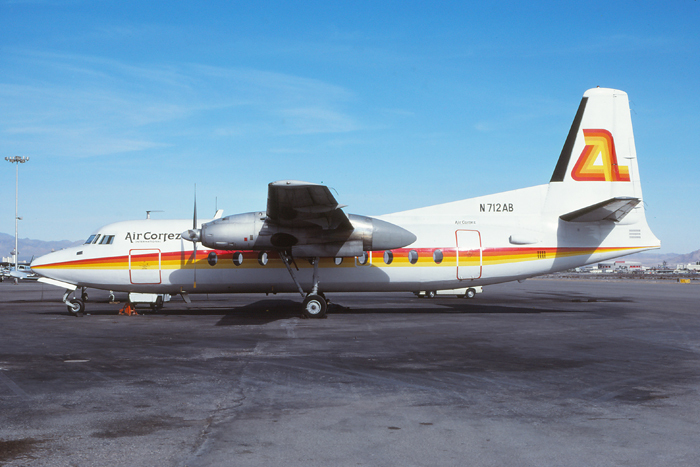 Air Cortez would eventually operate five of the F-27 turboprops and there was discussion of purchasing the British Aerospace BAC-1-11 jet aircraft for further expansion over existing and new routes. Unfortunately the small airline ran into financial problems and suspended all scheduled services in 1985. Charter and freight work continued out of Las Vegas as well as to destinations in the Caribbean from Miami until 1988, when all aircraft and assets were sold off. Parked at Las Vegas in January 1984 is N712AB, a Fairchild F-27J. 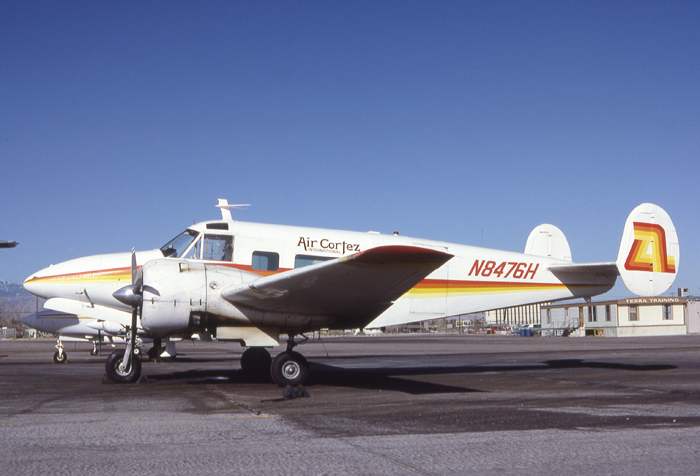 Air Cortez utilized Beech-18 on its initial Las Vegas-Grand Canyon flights. Parked at Las Vegas is N8476H, a Beechcraft H-18. 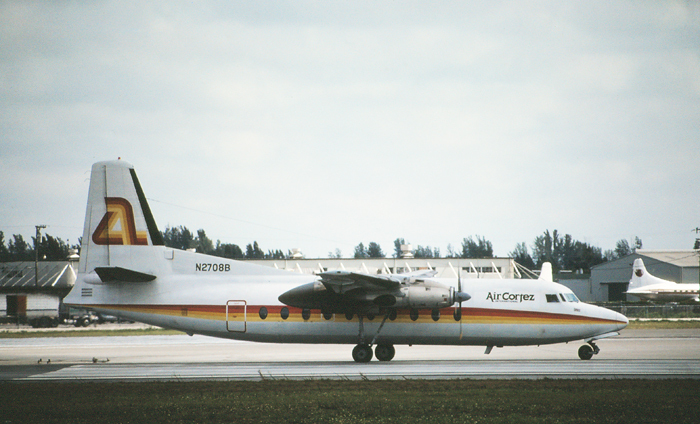 Preparing to depart at Miami International Airport is N2708B, a Fairchild F-27F.